We reached Kalyan Das temple nestled inside Qandeel Public School of blind children in Kohati Bazar on a rickshaw. It is very close to banni chowk. Built by a prominent Hindu business family of Rawalpindi in 1880, the Kalyan Das temple is an awe-inspiring sight. Lala Kalyan Das Suri was the patriarch of the family who financed and then ran the temple administration. Lala Kalyan Das had no child of his own, he adopted his brother’s son named Diwan Chand Suri. The Suri family had specialized in the trade of wood. 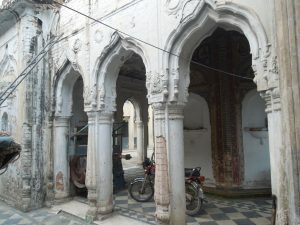 Their haveli is still in Kirtarpura area, and has been renamed ‘Nuri manzil’. Their present-day off-shoot is the Tata family, who are now specialized in motor vehicles around the globe. Suris had a presence in Delhi before partition as well. After the great divide, Suris migrated out of Pakistan in 1947 and joined their folk in Delhi. Now the Suris own the tallest apartment block in New, Delhi. Most of the Hindus and non-Muslim families of Rawalpindi used to live in a cul-de-sac on the Western flank of Muree road. Their community was protected by the Nullah Leh from the West and South and Government Buildings to the North. Mohanpur, Kirtarpura, Kohati Bazar, Bagh Sardaran and Gunj Mandi were their areas. The Suri family, like the Rai family lived in the same pocket. Smack in the middle of Kohati Bazaar, the then ground zero of affluent Hindu traders, this temple is one of the biggest in a network of temples all around the place. Hindus preferred staying together and in exclusive settlements and narrow lanes, within a miles radius, around Bani Chowk area. This temple was their evening get-together joint. They would chat every evening in the Temple premises under the shade of Banyan and Piple trees outside the courtyard. The temple itself was surrounded by clear water pond or the Ashnan area. 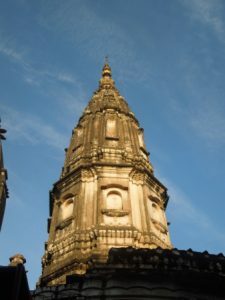 The main structure was on higher ground and each rank of Hindu devotee was assigned a particular level which they were not allowed to cross while climbing towards the main temple. Only Brahmins were allowed to cross the white marble terrace to reach the main structure across the pond. The most pious of Female devotees were housed in one of the four corner rooms, where they prayed all year round, and served the head priest. The temple complex was spread over 5-acre area and had 100 rooms for visiting devotees. The temple door is made of sandal wood and is carved to perfection. Each mural is etched in expensive stones like lapis, which are only available in Afghanistan. The tiles are still as good as new, I thought they had been renovated recently— in fact they are 150 years old. All three (Trimurti) Hindu deities are depicted in the murals; Brahma (creator), Shiva (destroyer) and Vishnu (preserver). Then we have lord Ganesh and Lakshmi also. The main spire has figures of the chief patrons of the temple. 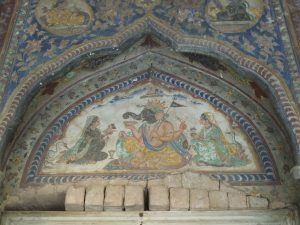 One inscription on a fresco mural in Gurumukhi says ‘Shamaskhi’; this means the tale of Bhagwan Krishna. As Lord Krishna is the Hindu god of mercy, compassion, and love, this points to a peace-loving and accommodating the community. Every spring, the Hindu pilgrims from all across the world would gather here, rest, bath, dress in their ceremonial robes and then begin their barefooted walk right up to the Amaranth Caves in Indian Held Kashmir, through Murree hills. The legend has it that somewhere around 1946-47 Lord Krishna descended from heaven at this very site and addressed the Hindu community saying, “Your days here are ended. Prepare to migrate!” The legend says there were 200 devotees at that time who would swear they saw Lord Krishna utter these words. Pakistanis have generally respected the place except for one incident after the Babri Mosque episode when vandals pulled down the brass tips of the spires. Prophet Muhammad PBUH forbade destruction of places of worship and monks in them. The temple grounds now house a visually impaired school. The funny thing is that even the current generation of Suri family in India washes their hands after meeting Muslims. I wonder how they must have treated Muslims while they were in power in Rawalpindi. Oh! In case you are wondering, the Hindu families took all their gold with them. It wouldn’t be a bad idea to let the accomplished Hindu families of Pakistani origin bring back some of their expertise to the country. At least they would be better adjusted as compared to the snooty nosed white folks; whom we beg to bring in investment. Stay tuned for more interesting historical gems! very informative. 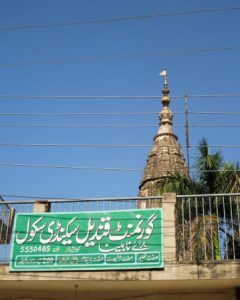 I had seen the temple from outside while passing though raja bazaar and have always wondered what story it had to tell. Thanks for a lovely and interesting article.